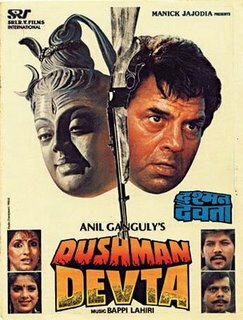 Dushman Devta (1991) is set in a small, defenseless village plagued by bandit attacks. We're introduced to the sweet, innocent residents by a singing village belle, played by Dimple Kapadia (who is of course, gorgeous, but just past the age where she can pull off this type of character). She's not the only belle in town though ... a scantily-clad Sonam is also prancing around town shooting sheep and horses with her tranquilizer darts and aggressively pursuing town hunk Suraj (Aditya Panscholi). It's a good thing too because "animals" (Ahem! Dacoits in bad gorilla costumes) are apparently also terrorizing the villagers. Sadashiv Amrapurkar and Gulshan Grover are around doing their usual shady dealings as the local corrupt thakur Raja and his Number Two. 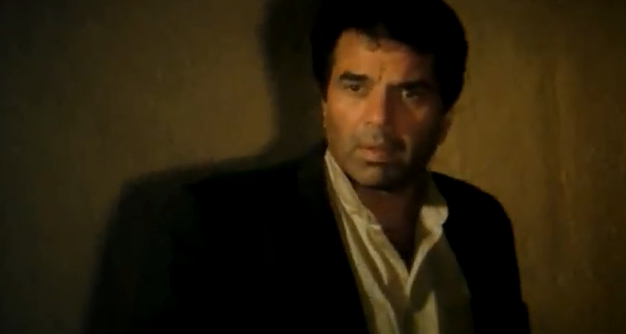 Enter Dharmendra as surly, rogue-ish Shiva! He arrives near the village with Master Dina Nath (Dr. Shreeram Lagoo), who tells him about his sad past. He tells Shiva that he considers him to be like his son and wants him to help protect their village. Suddenly Dina Nath is shot by Number Two (Gulshan Grover). Shiva goes to take the body back to his family, and Dina Nath's wife - who had gone pagal after her son was killed - receives him enthusiastically as her son. Unfortunately Suraj and gang come along and believing Shiva to be Dina Nath's murderer, attack him. The villagers all argue that he couldn't be the killer, and try to revive Shiva. In a series of events, the villagers come to believe that Shiva is a living incarnation of Lord Shiva and fall at his feet, swearing their undying devotion. Dharmendra has a past of his own he needs to escape, and reluctantly agrees to stay in the village. This is where things get fun! While this certainly isn't highbrow cinematic art and is guilty of the 80-90s cliches of rapeyness and gaudy costuming, this movie stuck in my memory for being unapologetically silly and fun. It doesn't seem like anyone was really trying all that hard in this film, except for maybe a few of the background extras. Dharamji's Shiva is a gruff, embittered drunkard who is ultimately inspired to protect the village that constantly chants to him "Aap to Antaryaami hai!" (the line that cracked me and my sisters up while watching this). He's absolutely hilarious and gets to show off his dry humour. This is pretty late in his career as a hero, but it works well for the character. He reminds me quite a bit of Sunny today. Or I guess I should say Sunny reminds me of him? Anyway, their father-son resemblance never struck me as much as it did in this movie. Dimple as either Gori or Gouri (I never figured out which one) is feisty and loudmouthed. She may be a bit too mature to play the village belle, but she still gets some wonderful scope here to angrily rile up the sheep-minded villagers. And speaking of sheep (or shooting them with darts) -- Sonam is one tough cookie too. Her tranquilizer darts come in very handy when she flips the damsel-in-distress situation to save her man, and later towards the climax too. Sonam is an interesting actress to me. She's obviously not a GOOD actress, so I'm not sure why I like watching her in films (I also loved her in Tridev, Chor Pe Mor and Ajooba). There's something strangely admirable about her lazy approach to acting, something irreverent ... it just doesn't seem like she cares very much about acting and is just doing it for a lark. And I think she was only 15 when she did Tridev, so she was probably around 16 in this. It shows. She's mostly in this movie for skin show, but I thought she was sort of kickass. Aditya Panscholi is ehhh to me. As he usually is. 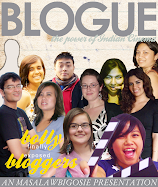 This is by no means a must-see film, but it IS sort of funny and decent timepass. It certainly stuck in MY memory all these years! 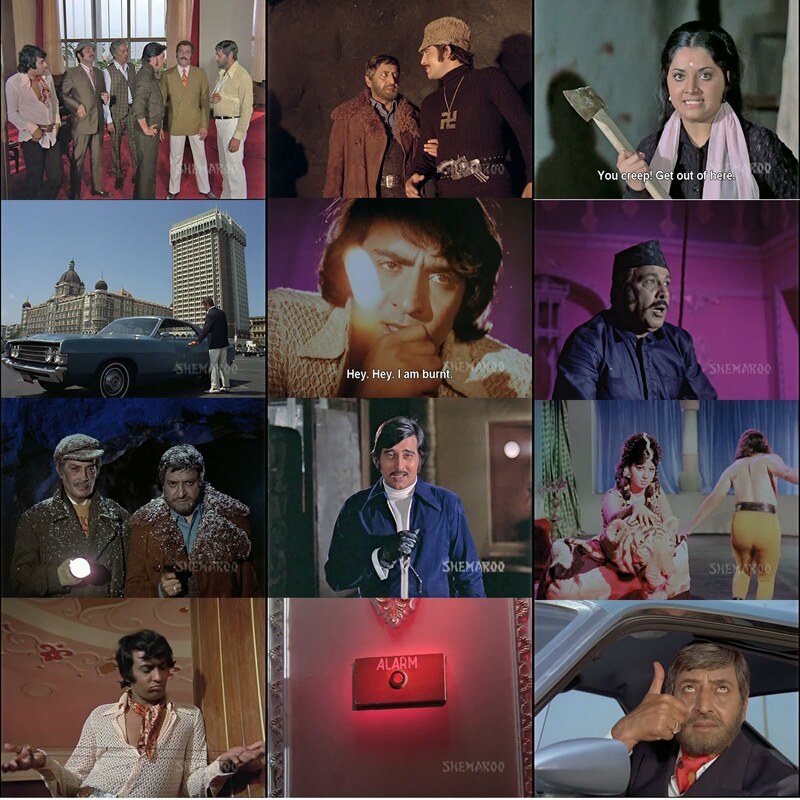 For more Deol Dhamaka fun, visit our links!